We all have our go to-pre-workouts foods, be it a simple bowl of oats porridge or a peanut butter sandwich. However these snacks can be a little too filling right before a workout. 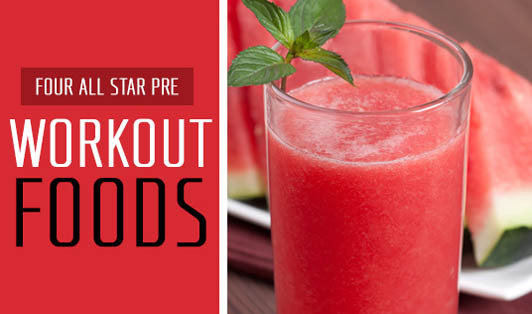 That’s when these surprisingly light pre-workout foods and drinks will help you. Watermelon is a rich source of the amino acid, L- citrulline. L-citrulline is known to provide relief from sore muscles after an intense workout. The same effect has been noticed with cherry juice, which contains many anti-inflammatory antioxidants. Many runners depend on salt tabs when running in hot weather to prevent muscles from cramping. However, it has been found that salty foods work the same way. Chicken soup contains almost 1,362 mg of sodium, meets the requirement of athletes and also keeps them hydrated during their run. Having an afternoon cup of your favorite coffee is not a bad idea, especially if you are planning to hit the gym after work. According to a study published in the British Journal of Sports Science, runners who drank a small quantity of coffee before running 1,500m on the treadmill ran 4.2 seconds faster than the control group. It was observed that coffee drinkers experienced an enhanced oxygen uptake too. The antioxidant-rich watercress leaves prevent DNA damage caused by the high-intensity exercises and help to relive sore muscles. Eating watercress leaves 2 hours prior workout will definitely help.